Pizza Recipe in Microwave - There is nothing delicious comfort food is better than pizza with full of cottage cheese.This is famous Italian Food and in these days India's too.There is nothing comparison with this food. While the pizza appears to be a store bought, we are not sure what is going on in making it. Preparing your child's favorite food at home is always a good idea because then you are able to control the quality of the ingredients in your food. Making this cheese pizza is easy and very tasty. You can make it in microwave, on an tawa or even pan.There is another easy way to make it more tasty and healthy. Apart from this, if you are like some who love furry white sauce, you can prepare it with a cheesy white sauce as a base, with more cheese and some chili flakes and garnishing of your choice.Let'checkout Recipe First. Step 1 : Take a bowl and add 3 cup of lukewarm water. Add 1 teaspoon of dry yeast seeds and cover the the bowl and keep it for 4-5 minutes. Step 2 : Filter Maida by filtering it in a vessel. Mix olive oil and salt in the Maida and mix well. With the help of yeast water, Which we prepare before it in Step 1,mix all and knead flour maida and make a dough knead it for 5-7 minutes or turns the maida smooth. Spread some olive oil on kneaded dough with hand and keep it in a deep vessel, cover it with Kitchen Towel and keep it in a hot place. The dough gets double in 2/3 hours. The dough is ready to make pizza. Step 3 : After 2/3 Hours when dough is completely ready.Take out from Vessel and knead once again then roll it to roller board to 10 inches in diameter round shape, and make Half cm thick pizza base. Step 4 : Preheat the oven on convection mode at 220 degree Celsius,Chop all the vegetables in microwave safe bowl capsicums ,onions,tomatoes and mushrooms.Microwave all these veggies for around 30 seconds. and spread all the veggies which we prepare in step 4 over the spreaded tomato sauce .Then Put grated mozzarella cheese top of pizza and sprinkle some Chili flakes. Step 6 : After topping now Place Pizza tray in Pre-Heated Oven at 220 degree celsius and set timer for 20 minutes or till cheese melts. 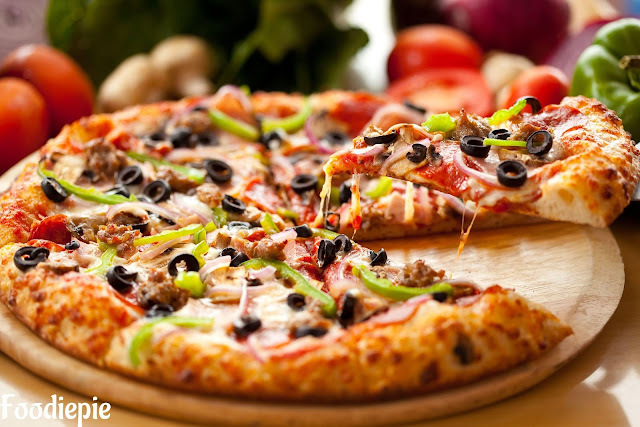 Finally : Delicious Pizza is ready topping with black olives and capsicum slices.Cut into slices and serve with sauce.